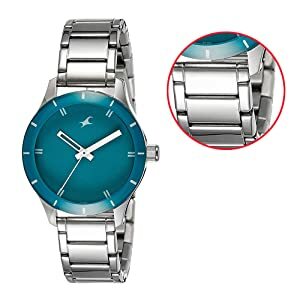 Amazon's Choice for "fastrack watches for womens latest"
Why wear your attitude on your sleeve, when you can wear it on your wrist? 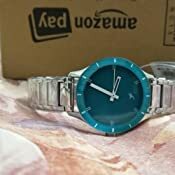 Our delectable dials for guys and girls, will help you lose track of time, in style! 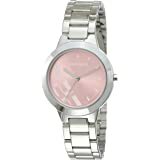 Women's Watch by Fastrack - Your All Time Companion! 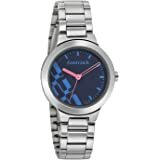 Charm everyone with your sense of fashion by sporting this elegant blue dialed watch from the house of Fastrack. The big blue round dial watch embodies class and sophistication with its unique look. Made of brass, the case material features a classic blue dial with white hands of the watch. Its water resistant feature works as a boon for people who perspire a lot, withstanding regular use with ace. 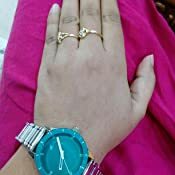 Accessorise yourself with this watch paired with jeans and a cute top to stand out of the crowd and be the centre of attraction. Remember, what you wear is what defines you. This attractive and smart watch by Fastrack boasts an analog display. The round dial has a soothing blue colour, flaunting white coloured hands of the watch creating a stark contrast. 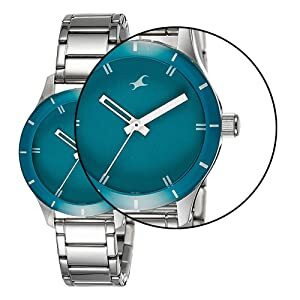 The movement of the watch is quartz. 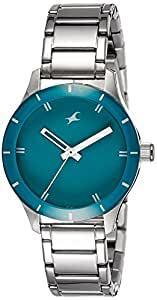 This classy watch from the house of Fastrack oozes class with its stylish stainless steel strap flaunting a matt silver colour that ends in a push button clasp. The intricately designed lined patterns on the strap provides the wearer with a glamorous look. 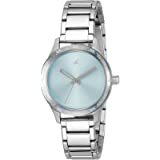 The stylish watch displays a white dial with double line sticks at 10 minute intervals. The brass casing boasts stick time marking at 5 minute intervals. This embodies ultimate sophistication and provides the wearer with a classy look. 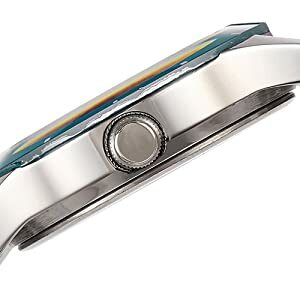 The stainless steel strap of the beautiful watch ends in a push button deployment clasp that functions the same way as a regular deployment clasp, but has buttons on either side of the clasp that must be pinched to release. 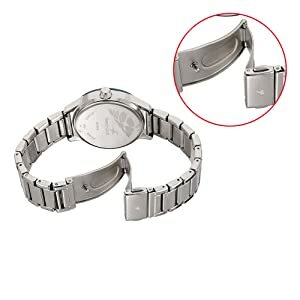 This ensures the clasp does not open on its own. No need to panic now when you suddenly get caught in the rain. The age of putting all your valuables inside your bag especially your watch in the rain is gone. 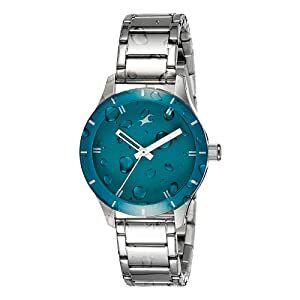 This watch from Fastrack is water resistant up to 30 meters and can withstand regular wear in the rainy season. 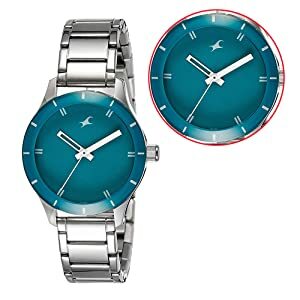 This sophisticated round dial watch from the house of Fastrack boasts a silver coloured crown on the right side which can be easily rotated to adjust the time of the watch as per requirement. 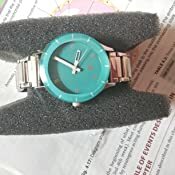 I got this watch just now it look good but battery is not wrking got h death watch ...sad 😑..really vry bad bad job u people should check and thn snt th watchs . Item is as shown in figure. 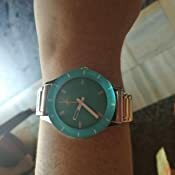 I gifted to my wife, it looks awesome in her hands. Super product and great quality. My darling love it. Thanks to Amazon. You guys are Amazing. dial colour is totally dim , has shoe in the picture of product .